Sorry for the delay (again) in posting here. I’ve been busy the last 2 weeks, trying to photograph grizzly bears. I just returned, 24 hours ago, from a trip to Katmai National Park, where I focused on trying to get some grizzly bear photos that were different to what I’d shot in the past. Here’s the first of what hopefully won’t be too many that you get bored with them. Yes, it’s true – I took some time out to detour away from Wrangell – St. Elias National Park, when I promised myself not to – but the change did me great! One of the things I really wanted to focus on this trip was to catch a nice blend of bears and fall colors – hence I travelled to Katmai National Park a little later than usual. While I missed more than my fair share of photos opportunities due to various different screwups I made along the way, I did manage to grab a few that worked out OK for me. 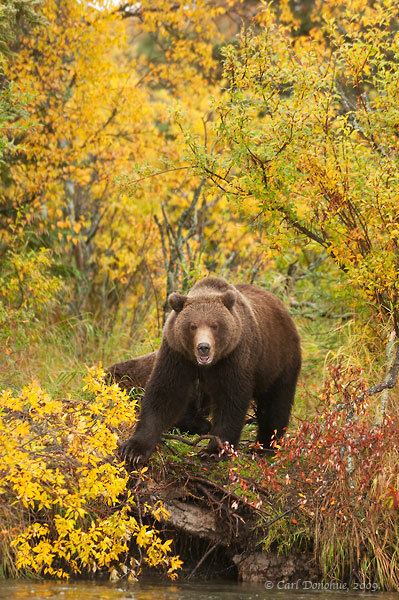 I intend next year, 2010, to run a “Grizzly Bears in Fall” photo tour, similar to my current Skolai Pass Phototour. Details aren’t finalized yet, but it should be a fun trip .. a small group, no more than 4 people plus myself, camping in Katmai National Park, wading the rivers and photographing the great brown bears and brilliant fall colors of the region – good times! More brown bear photos to come. This entry was posted in Adventures, Alaska, Fall, Grizzly Bears, Katmai National Park, News, Photo business, Photography, Wildlife and tagged Brown bears, Fall, foliage, Grizzly Bears, Katmai National Park, mammals, Ursus arctos, Wildlife on October 4, 2009 by Carl D.
Well, you certainly had some much better color to work with than where we were in the coastal areas. Seems like it was just getting started in the bay areas. Good stuff Car!. Thanks for correcting my ID mishaps. I was looking forward to hearing how the late season bear viewing went over there – so far, it looks like it was a great success! I look forward to seeing more photos and hearing more stories. Very nice. Glad to see that the fall colors were still hanging on in Katmai for your visit. I certainly enjoyed my visit to McCarthy for fall colors. @ Jon: Fall in the McCarthy area is awesome, too. Glad you had a good trip there. We shoulda been in touch beforehand and tried to meet up somehow before you left. Yep pretty amazing shot, maybe I can come next year…. did I ever tell ya about my great Uncle Karelian? Bears is in my blood…. You’ve tempted me for sometime in the future though. But not next year, we’re going to the Khutzeymateem in May for three days and that’s our big griz trip for the year. Should be fun. I’ll be curious about your trip next year – keep me posted on how that goes. I hear it’s a blast. You comin to AK backpacking next summer? Doesn’t look like we’re going to AK next year, as this Khutz trip will chew up our travel budget pretty much. This is a three day boat trip with a float plane in/out – so the expense is pretty crunching. But, we’ve been on the lookout for a decent sounding trip to this place ever since it was made into a provincial park way back in the 90s. Should be pretty cool. We offered to take my uncle to the Gates in Aug ’10 if he’s interested, but I doubt he will take us up on it. If he does want to go, then we’ll have to go over budget and put together a trip up there – but that’s the only way we’ll end up in AK next year. If we don’t go next summer, we’ll probably do a Gates trip in 2011. Getting an itch to see some caribou in decent numbers! Just finished up a 2 weeks trip to Jasper, Banff, & Kootenay NPs. No photos, but we did a ton of dayhikes & scrambles. Weather was absolutely perfect – a nice change for us from our typical vacations the past two years (rain & more rain)! Let me know a little more about this Katmai trip when you get more details together. Definitely something we’d think about. I really like this shot! The fall color really sets it apart. A bears-in-fall phototour, eh? You are tempting me. As you may remember, though, I’m going to need more glass – I’m thinking about the Canon 400/5.6L – $1200 and sharper than the 300/4L+1.4TC, and sharper than the popular 100-400/4.5-5.6. I can add TC’s, but would lose autofocus with the 5DMII. I need something before my Yellowstone in Winter trip in January, but I’m not ready to drop $4000 for a faster lens! I’ll keep you posted – it’d be awesome if you and Carol could make it. Do you fly in to Gates from Coldfoot, or Bettles? If you schedule it when I’m not guiding, I’d love to get up there again soon. Been too long since I walked the Gates. 2 weeks in the CA rockies with perfect weather and no photos? That should be illegal! 🙂 .. Glad you had good weather though man .. nice. Backpacking or just hiking and car camping, etc? Yeah, you’d definitely want some longer glass. Though with 24 mp, you could use a 200mm and crop everything, and not have to lug all that crap around. 🙂 With your camera, I don’t think the faster lens would be worth the cash. Don’t rule out the 100-400mm though – some of my friends say their copy is great. But the 400mm 5.6 is supposed to be a great little lens, for sure. For the bears, I think you’d definitely want something that is TC compatible. As I think about it, I’d suggest the prime, as you already have a 70-200mm 2.8 . so the prime and a 1.4 TC would be best, I think. I can’t wait to see what you get from your upcoming winter trip.